Pink macarons, creamy roses and peonies, gold beaded chargers, and sequined linens only begin to hint at the textured loveliness of Jamie + Jeff's spring wedding day. 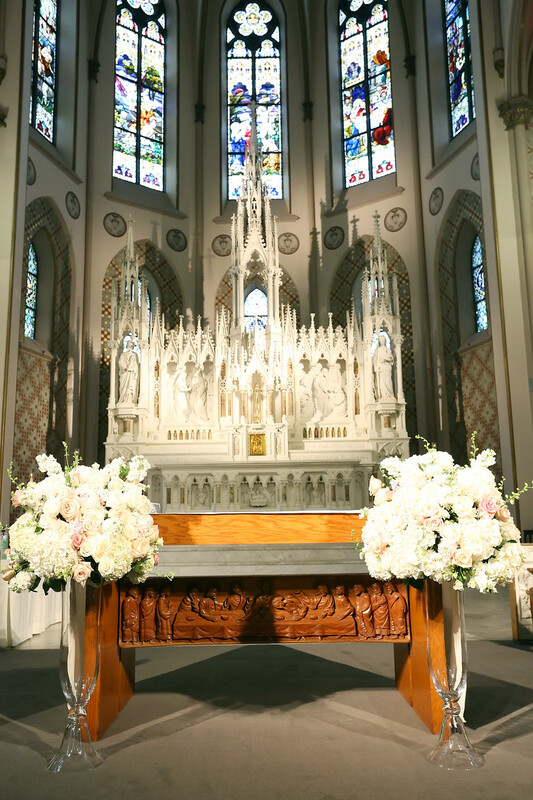 Vows were exchanged in East Walnut Hills' St. Francis de Sales Church followed by an elegant reception downtown Cincinnati at The Center. Jamie was beautiful in her white mermaid style gown with beaded belt and veil. Her bridesmaids wore barely blush dresses in mixed necklines and cuts. White bouquets included roses, peonies, and hydrangeas for a rounded, neat look. Reception tables were set with a variety of textured floor-length linens. Round and rectangular tables were covered with tiny opal white and champagne sequined cloths with ribboned white satin on the long, family style head table that sat over 20 guests. Jamie + Jeff sat in a small loveseat with their closest friends. Guests sat on silver chiavari chairs. The floral palette was soft white, creams, and several shades of pink. Full floral arrangements with roses and peonies reflected the abundance of the spring season. A lively mix of tall and short clear glass centerpieces added a glamorous touch to The Center's contemporary space of high ceilings, hardwood floors, and crisp, clean walls. Gold beaded chargers hinted at the gold polka dot stationery, dinner menus, and layered chevron patterned wedding cake. Gold votives and gilt bowls were clustered around for an overall dreamy, elegant, and perfectly Queen City wedding day.